UPDATE: It’s the spookiest time of year: the leaves have turned, the days are getting short, we’re preparing for Halloween. There’s a lot to fear out there, including some things related to divorce. Here an older post about divorce urban legends that people too often take as fact! ORIGINAL POST: You can find tons of information about divorce floating around out there. Much of it’s accurate. Unfortunately, much of it isn’t. It’s often difficult to tell what’s real and what’s a divorce urban legend. Usually, urban legends are the stuff of horror movies, a hook-handed madman preying on unsuspecting teens at Makeout Point. But misinformation about divorce portrayed as fact can give unrealistic expectations and damage cases. When ending your marriage, it’s important to have an accurate idea of the process. Things can and often do take unexpected turns in divorce. Still, it’s important to have a practical grasp of what you’re getting into. Knowing what’s real and what’s not can go a long way towards defining your goals. It may not always be what you want to hear, but it’s better than the alternative. 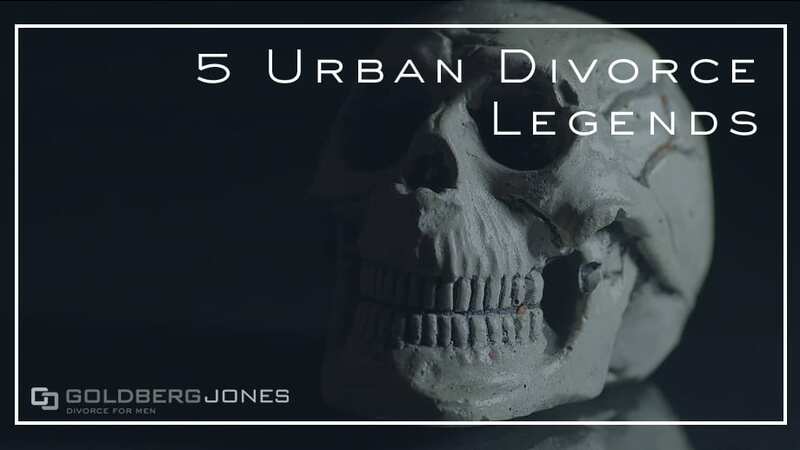 With that in mind, here are a few common divorce urban legends you should know the truth about. Many people think adultery cost a person everything in divorce. You cheat, you lose the kids, the car, the house, the dog, right? That makes great drama for movies and TV, but that’s not the way it works. In reality, an affair may cost you your marriage, but it doesn’t always impact divorce settlements. As with most states in the union, Washington practices no-fault divorce. That means no one takes the blame for ruining a marriage. You don’t have to prove anyone was in the wrong. Unless adultery damages your finances, it’s not likely to play a part in the division of property. The courts don’t play moral police. Distributing shared assets isn’t used as a punishment for wrongdoing. In certain situations, however, it can have an effect. For example, if your spouse drains your shared savings buying gifts for a lover, then it may prove relevant. Child custody follows a similar path. Unless an affair directly impairs parenting ability, it’s not usually an issue. Again, it can under certain circumstances. For instance, if your spouse leaves your kids alone and unsupervised while carrying out an affair. Situations like that may have an effect. Otherwise, this is a common divorce urban legend many people accept as fact. If you live with a partner for a certain number of years, the law considers you married, right? People throw the term common-law marriage around often. It’s thought of as a kind of de facto marriage, when two people live together as if married, but without actually tying the knot. But is this true or another divorce urban legend? While a handful of states to still have common-law marriage, Washington does not. It does, however, have committed intimate relationships. Similar to common-law marriage, this is when a couple lives together in a marriage-like way. They cohabitate, pool resources, purchase property, and all the rest. There are no specific criteria for committed intimate relationships, but the court considers things like the length of the coupling and the degree to which the two lives intertwine. This protects individuals in long-term relationships. It also helps deal with legal and financial matters after a break-up. Often, the proceedings look a lot like divorce. The deck is stacked against fathers. Mothers always get the kids. These are statements you hear often. Many believe that when it comes to child custody cases, the courts automatically hand children over to the mother. Though many men feel they’re at a disadvantage in child custody battles, legally speaking, there’s no preference given to parents based on gender. Admittedly, it doesn’t always work out like that. But on paper, each has the same right to pursue custody. The overriding goal is to serve the child’s best interests. Above any other factors, that’s what guides custody decisions. Courts recognize the value of keeping both parents in a child’s life. So unless there are extreme circumstances, even if you don’t get custody, you have the right to regular visitation. “But what if my spouse won’t give me a divorce?” Again, this is something often heard on TV and in movies. It makes for good watching, but thankfully, this isn’t a made-for-Lifetime drama. No one can force you to remain in a loveless marriage, and neither spouse can deny the other a divorce. It’s possible for one person to make it tough on the other, but the idea both parties have to agree is a common divorce urban legend. Getting your spouse to consent to divorce certainly makes life much easier, but it’s not required. You can fill out and file the paperwork and get the ball rolling. Part of the process involves serving the documents to the opposing party. Your spouse then has a certain amount of time to respond. If that doesn’t happen, you can file for a default judgment. This essentially grants you a divorce on your terms because your spouse didn’t object. Related Reading: What If My Spouse Doesn’t Want To Divorce? One of the first images that springs to mind when you think of divorce is probably a courtroom. You have judges, gavels, and lawyers in suits. Both sides call witnesses, cross-examine, make objections, and it all plays out like an episode of Law & Order. Only that’s not usually how it goes. The idea that most splits go to trial is a divorce urban legend. Divorce can wind up in a courtroom. But not every last one winds up in front of a judge. In fact, most don’t. Before things get that far, couples usually come to terms in one way or another. If both spouses agree on all the important issues, a split can be fairly simple. The less complex a marriage—short, no kids, little shared property—the smoother things often proceed. When there’s more conflict, tools like mediation or arbitration are frequent options. These allow both sides to sit down, often with representation, and hammer out a mutually agreeable divorce settlement. While they do happen, the idea of an intense, drawn-out divorce trial largely remains an urban legend. These are just a few common misconceptions people have about ending a marriage. A quick Google search is sure to unearth countless other divorce urban legends. With all the misinformation out there, it’s important to know what’s true and what’s false. You don’t want to go into your case with unrealistic expectations that may hurt your case.